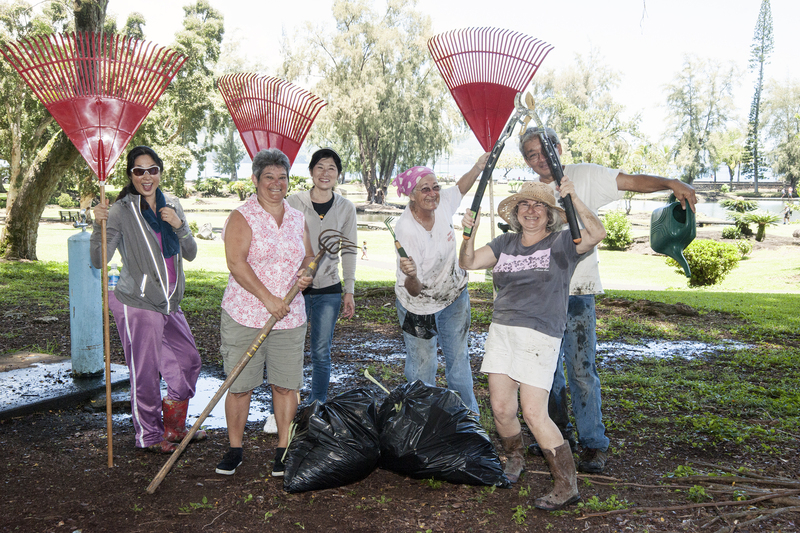 The fourth volunteer day at Lili`uokalani Gardens held Saturday, August 16, concentrated on storm cleanup following Hurricane Iselle. Many of our regulars were busy with their own homes or were volunteering in Puna, the district of Hawai`i island hit hardest by the storm. But we had nine eager folks who filled 20 large bags with downed leaves and sticks in no time. We also worked on removing one large snapped limb from an orchid tree near the restrooms. Some of it still remained in the tree at the end of our time — beyond our reach. Michelle, Hiroko, Sami, K.T., Jennifer and Craig are a little goofy at the end of the work day. Additional effort went into continuing to edge the spring-fed pond and removal of seaweed from the pond near the stone arched bridge. This helped County workers get the park ready for both the Firefighters annual walk and run held Saturday, August 23, and the upcoming Queen’s birthday. 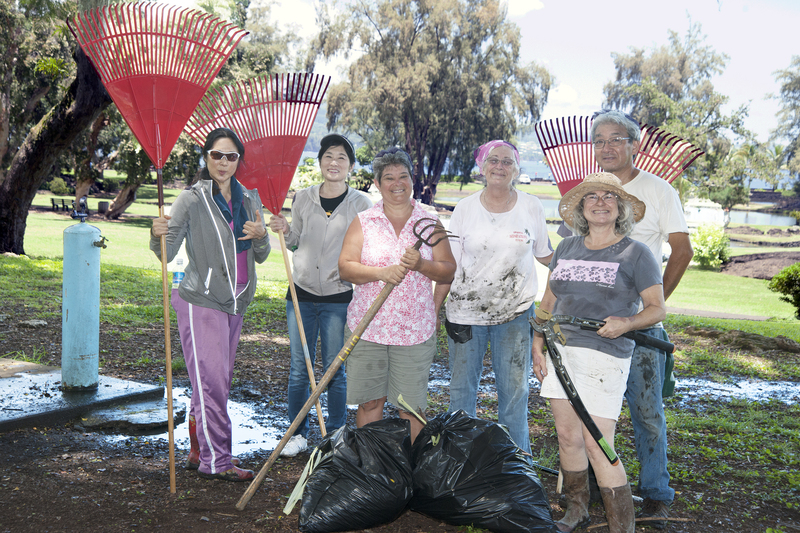 Weeding and leaf removal was done on two areas central to the annual Queen Lili`uokalani Festival — He Halia Aloha — which is scheduled for Saturday, September 6, from 10 a.m to 4 p.m. Sponsored by the County of Hawai`i, the Queen Lili`uokalani Children’s Center and the Hawai`i Tropical Flower Council, the all day free event will feature cultural activities and demonstrations, craft booths, mass hula surrounding the ponds, taiko drumming, Urasenke tea ceremonies, and plenty of local entertainment. 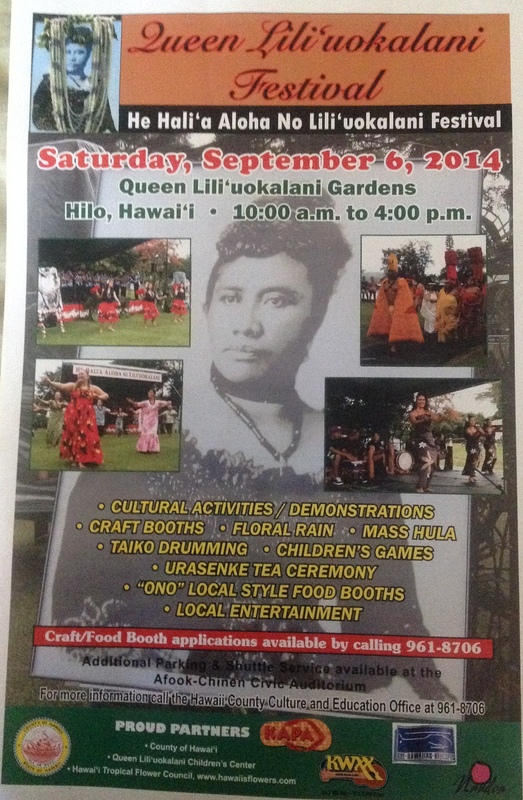 For more information on the festival, contact the Hawai`i County Culture and Education Office at 961-8706.